Pricing/subscription options for FileMaker Pro 17 Advanced can be seen here. 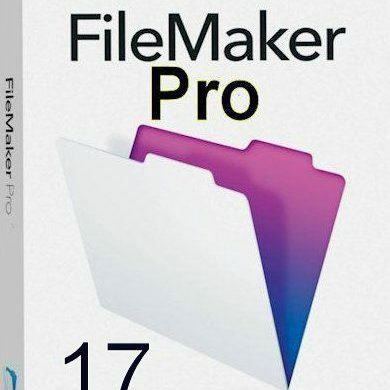 Operating requirements: The FileMaker Pro 17 Advanced platform runs on and with macOS Sierra 10.12 and above (as well as Windows); iOS 11.2 and above, iTunes 12.x and above; Safari 11.x, Chrome 65 and above etc. As has now become the annual norm, Apple subsidiary FileMaker released version 17 of its venerable FileMaker Pro application platform earlier this month. What began life as a database, added relational capabilities – and more – to become its own RDBMS (Relational Database Management System), is now a sophisticated, robust and highly versatile platform in its own right. MyMac has reviewed all recent versions of FileMaker. To catch up, start here. The new features of FileMaker Pro Advanced version 17 were evaluated for this review. Although not every feature was examined, it has to be said up front that – over an extended evaluation period – those that were performed impeccably, without the hint of a hitch, and in every way as expected with such a top-of-the-line product. Several new features and new functionality in a variety of areas come with this update. It has also effectively changed its name. Version 17 of FileMaker Pro Advanced continues the direction taken in recent years: it is to be identified not (so much) as a database tool – albeit a very comprehensive one. And more of an integrated system to create and manage other applications based on the FileMaker structure for end users. Some vital developer tools, routines, logging and reporting, as well as scripting functionality previously came only with the ‘Advanced’ versions. Now they are part of the standard desktop package, which has been renamed – simply – FileMaker Pro Advanced. Oddly, even though you will have bought the newly-branded ‘Advanced’ version, you actually have to go to an ‘Application’ preference in the ‘General’ tab to activate them after you’ve relaunched FileMaker. 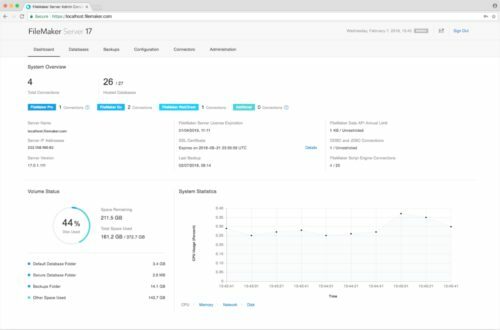 The new features in this version effectively fall into three areas: use of the suite while apps are being developed; integrated deployment across the network and cloud; and in the mobile environment. Assume that you, or your organization, has heard all the good things about the FileMaker platform and want to get started immediately. The ‘template’ apps which are supplied as predefined starting points when you install the product have been enhanced and increased in version 17. Even those familiar with the FileMaker environment are likely to find these a real help sooner or later; there are other tables to work with them as well. This replaces the old ‘Launch Center’. Layout mode has been rethought to some extent, making it even easier to use, while at the same time not sacrificing any functionality at all. For instance the new ‘Master-detail’ layouts take advantage of portal enhancements here to let you easily create such familiar design layouts as those in Apple Mail, where the ‘Master’ displays top-level data from one table (just a client’s first and last name, say) typically on the left of a screen or page, or at the top. And the ‘Detail’ often occupies the rest of the screen with as many of the (other) fields as you want corresponding to that record and so making presentation of the data as you scroll through ‘Master’ comprehensive but easy to understand. This enhancement in FileMaker Pro 17 Advanced also does away with the need to create self-join relationships and write or maintain additional scripts. Given the prominence and demand for such contemporary interface paradigms, it’s likely that developers will make heavy use of such functionality. Even then, for those less adventurous but still wishing to produce elegant yet complex such solutions, one of the Starter Apps (‘Contacts’ in the case of customer records, say, or an address book) can be pressed into service to provide the necessary data and infrastructure as well as the corresponding presentation layer (Themes etc). FileMaker provides videos to help as well. The usual wizard-like workflow and set of decision branches is exemplary in the design/layout phase. As you add and manipulate objects, FileMaker Pro 17 Advanced pops up just the right dialog boxes for data-selection, references to tables, fields and records, always correctly graying out inappropriate or unavailable options. Although development work with FileMaker can be extremely intricate – as suits the high level of apps which it creates – it’s not only been logically conceived, but is also intuitive and helpfully interactive accordingly. Despite the complexity, if you understand the basic principles of database design and management, the rest really is logical and gets your work done speedily and transparently. There are other changes in this area which will take some of the donkey work out of table design and customization, scripting and the visual design… the positioning of Inspector, Fields and Objects tabs has been consolidated; indeed it adds to the feeling of solidity and reliability as you navigate around the document window. Everything is now more easily discoverable in one place. Then when you add a new table, fields are automatically created and displayed for records’ meta data… primary key, creation date, modification date, and the account of the field’s creator; these can be customized. It’s a small touch but one which shows how FileMaker can act as an educating tool steering (new or inexperienced) users towards good practice as well as making life easier. Other small but useful improvements in version 17 of FileMaker Pro Advanced are ones to the ‘My Apps’ window (a much more visible ‘Create’ icon; useful conversion routines), support for multiple email attachments and to copy and paste custom menus – a real time saver which is also likely to save you from possible errors. The new data migration tool will also save many hours of work: under some of those circumstances a developer needs to re-import data from a previous version (perhaps local) into one to which substantial changes have been made (perhaps on the server). Until now this has usually had to be done one table at a time. Now a command line does most of the work for you. It is, though, only available on subscription. There is, lastly, the by now obligatory set of improvements to FileMaker’s vast array of scripting tools. Version 17 also significantly streamlines the FileMaker Server Admin Console and FileMaker Admin API, which was previously a trial feature; it now supports scripts and file upload to container fields. If network connection is lost, you can now continue to work on local files not requiring the remote host until your connection is restored. There is also a a trial REST API which will work until September 27, 2019 the more flexibly to manage and administer your custom apps. You can buy Comodo SSL certificates 60 days before trial expiration instead of 30 days and collect information about the performance of your server and hosted FileMaker apps. Create message and script schedules that can be used across multiple servers. And integrate with third-party applications for custom monitoring and administration functionality. Importantly, a new security feature aims to protect custom apps against brute force and dictionary attacks – by temporarily locking an account after too many failed attempts to authenticate. Indicating further that the FileMaker platform is also aimed at an ever widening constituency of end-users, in version 17 you can script the display of local notifications on supported mobile devices when FileMaker Go (the iOS version of FileMaker) is not running (or is backgrounded), and send local alerts based on location. Drag and drop, auto-complete and keyboard shortcuts have all been improved for FileMaker Go – as has the iOS App SDK (Software Developers Kit). The new Sensor Support feature (using a new calculation function) allows you to capture appropriate information from iOS sensors in the iPad or iPhone, which include location, air pressure, accelerometer, magnetometer, gyroscope, barometer, and battery level. If these newly-introduced and enhanced features and functionality were all that the FileMaker platform amounted to, it would still be quite a remarkable system of products. Not everyone – especially those new to FileMaker and/or only vaguely aware of its capabilities and strengths – necessarily understands how well the platform combines the two virtues of simplicity and accessibility on the one hand. And extreme sophistication, extensibility and a far-reaching ability to build flexible and complex applications in almost every operating environment and a huge spectrum of workflows on the other. Version 17 makes these strengths more evident than ever. FileMaker works extremely well for those who want little more than an elegant, robust and flexible way to build a database to keep track of invoices in their small business, or their own collection of music for example. But it works equally well for those who want, say, to maintain their much larger businesses inventory, and/or who want be able to manipulate and display it securely while on the move, allowing multiple sets of users to contribute according to an array of user roles – and all in a visually-pleasing yet easily customizable fully interactive interface. Version 17 consolidates, more closely integrates, and extends what the platform can do to create attractive data-based standalone applications which are flexible, robust, available across devices, systems and platforms for many categories of end users. Yet which are accessible to the developer – with both basic skills, and much more advanced ones. The learning curve remains shallow. The extremely rich set of functions is itself indicative of the sophistication of this latest version of FileMaker Pro Advanced. 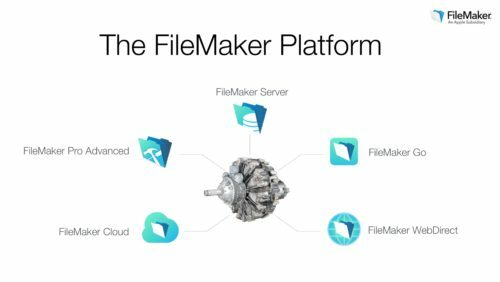 What’s more support, and supporting materials, continue to aid those developers who decide or need to invest time and energy in learning the FileMaker platform: in true Apple fashion (FileMaker’s parent company) learning on the job is unquestionably made easy though consistency and transparency of the development environment. Conclusions: On the one hand the change to what was previously the ‘Advanced’ version of FileMaker Pro opens many options – some of which developers will certainly relish… the debugging and Data Viewer stand out. On the other, this new default version still costs more than the one you would have bought had you opted not to use ‘Advanced’ ($540 where FileMaker Pro 16 was $329; or from $11 to $15 per month depending on the number of licensed users; with the upgrade price of $197). If, though, you’re really serious either about managing your valuable data in flexible, robust, well-supported and extensible apps, this will be money well spent. This year’s upgrade can – all things considered – be recommended. 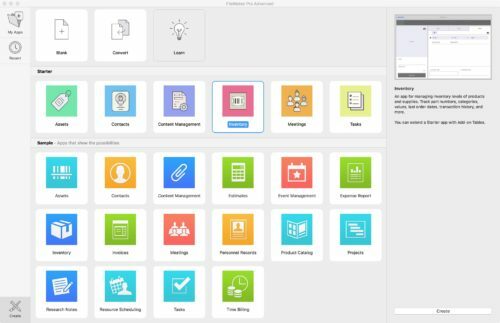 Pros: the elegance and stability of the ultra-reliable FileMaker platform has been further enhanced with a strong set of features. Those changes which have been introduced will confuse no-one yet satisfy many. Cons: pricing options can be a little hard to navigate and decide on; the cost for such annual upgrades may be considered steep by some users.